Kammetal processed 20,000 lb. 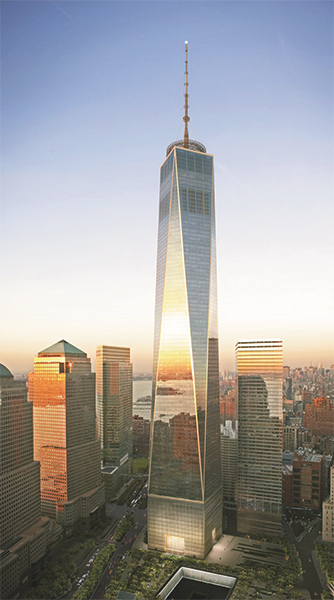 of 1/4-in.-thick Type 316 stainless steel to create 7 tons of decorative cladding that now sits atop the spire of One World Trade Center. One World Trade Center, also known as the Freedom Tower, has risen to fill the void left in the Manhattan skyline following 9/11. It now stands at 1776 ft.—the tallest building in the Western Hemisphere. At the top of the tower, a 400-ft. spire projects upward. It’s not only a symbol of perseverance, but also serves to support a worldclass broadcast antenna. The 18-piece steel spire, which weighs 800 tons, was manufactured at fabricating facilities in Canada and New Jersey, and then shipped to Ground Zero. The final subassembly, comprising the top 50 ft. of the spire, is a specialized stainless-steel beacon weighing nearly 14 tons. Brooklyn-based Kammetal, Inc., a full-service metal fabrication company specializing in architectural and ornamental metals, was contracted by structural-steel fabrication firm DCM Erectors to fabricate and install the architectural stainless-steel cladding that surrounds the beacon. Fabrication of the cladding began in the summer of 2012, but was delayed after Hurricane Sandy hit the East Coast. Kammetal is located in the Red Hook neighborhood of Brooklyn, where water from the storm surge reached 6 ft. above street level. According to Kusack, the company’s main shop floor sits about 4 ft. above street level, and was under 30 in. of flood surge during the storm. Every piece of equipment was submerged, garbage was everywhere and the shop was without power for five weeks. Once power was restored, the equipment needed to be repaired before the shop could return to business as usual. All told, downtime after the hurricane added about six weeks to what would have been a five-month job. Despite these overwhelming setbacks, the company processed 20,000 lb. of 1⁄4-in. Type 316 stainless steel to create 7 tons of decorative cladding that now sits atop the spire. To fabricate the decorative cladding, Kammetal laser-cut panels for the spire’s glass and stainless steel structure. 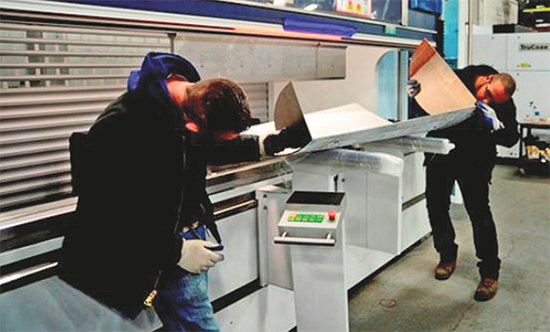 Press-brake operators then formed the thick stainless steel, performing multiple acute-angle bends in each piece. To fabricate the decorative cladding, Kammetal laser-cut panels for the spire’s glass and stainless steel structure. Press-brake operators then formed the thick stainless steel, performing multiple acute-angle bends in each piece. Bending the 7-gauge stainless steel into acute angles proved to be a fairly complex operation. To accomplish these tricky bends, Kammetal relied on precision-ground press-brake tooling (WT Style Precision tooling from Wilson Tool). It’s precision ground to a tolerance of ±0.0004 in. on critical dimensions to ensure reliable performance and help fabricators achieve optimum bend-angle accuracy. “The tooling worked really well for bending the acute angles,” says Kusack, noting that Kammetal fabricated all of the panels for the decorative cladding and installed the panels on the framework for the spire, built by DCM Erectors at a shop in New Jersey. Once complete, the entire spire then was shipped to the site in one piece using a carrier built specifically for that purpose. “This was really a meaningful project for us,” says Kusack. “I saw the towers fall from Brooklyn in 2001, the year I started Kammetal. Watching the beacon being hoisted into its final position atop the new world trade center was a moment in time I will never forget. It was a point in history when the rebuilding of the fallen towers was complete. Article provided by Wilson Tool Intl., White Bear Lake, MN: 651/286-6000; www.wilsontool.com.